Historians have long known that the ancient Swedish fortress Nientschantz was located on the territory of Gazprom’s proposed “Okhta Centre”. This territory was nominated for protection as a historical and cultural monument in 2001. Because of the threat posed by the construction site, archaeological studies were performed there by an expedition from the Institute for the History of Material Culture (directed by P.E. Sorokin) in 2006. 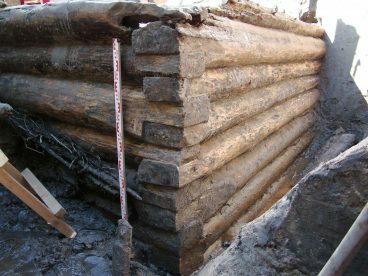 Archaeologists made a sensational discovery: an intact “layer cake” of fortifications and settlements from different time periods (17th century to the late Neolithic) were found under the “Petrozavod” building foundations. 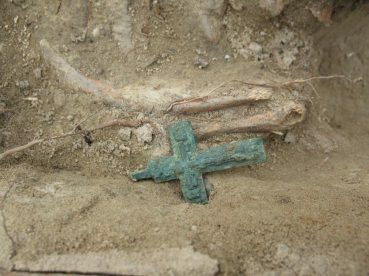 Nothing similar had ever been found in the northwestern region of Russia. 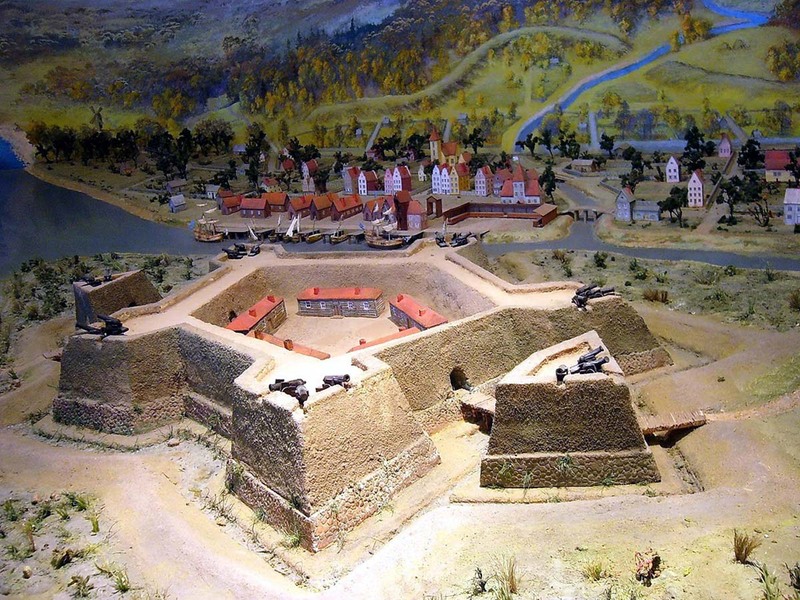 It was thought that the Nientschantz fortress had been completely destroyed by the combined effects of Peter the Great’s army, time, and the foundation of the “Petrozavod” building. But archaeologists proved that it still exists. 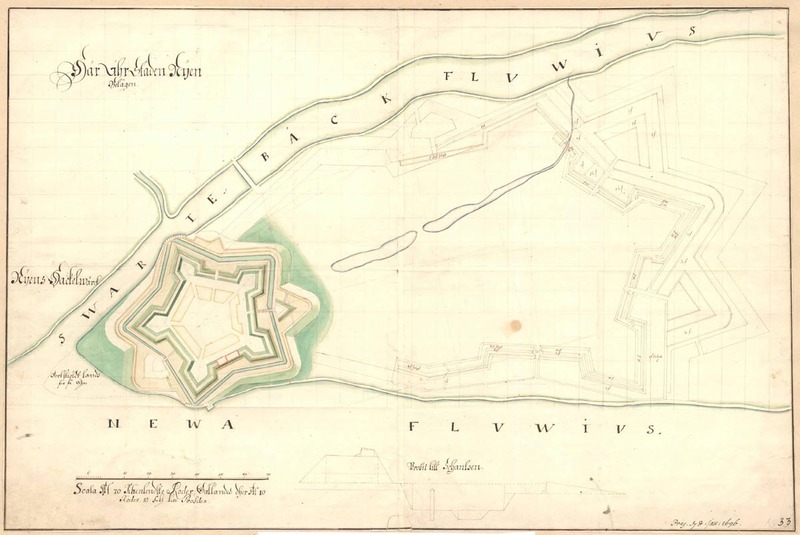 The fortifications’ geometrical splendor was well preserved underground: moats, bastions, the wooden foundations of ramparts and even a secret passage — a stairway descending to the moat – were still intact. A wooden door on the side of the moat hid this secret passage. One could descend to the moat onto a wooden platform at the bastion flank and fire along the stockade without being noticed by enemies. 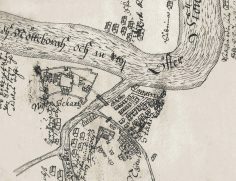 Excavations also led to the discovery of remnants of 17th century wooden homes, a brass casting shop, a well, and bridge piers. 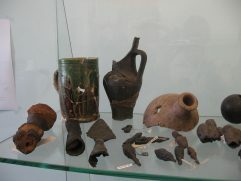 A wonderful collection of everyday objects was also found: pottery, fragments of clothing and footwear, Dutch tiles, pipes and coins. 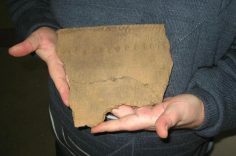 Numerous fragments of mortar shells were also unearthed, providing evidence of the assault on the fortress by Russian troops in 1703. 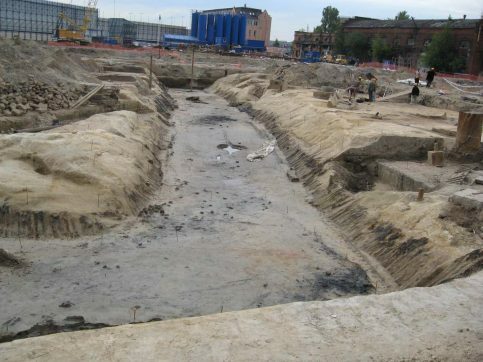 Scientists found not only the fortress that was seized by Peter the Great, but also an earlier one: the original Nientschantz. The plans of this fort are known thanks to Swedish drawings that have survived until the present day. Ниеншанц и город Ниен (фрагмент карты). На противоположном берегу Невы отмечен Спасский погост с храмом. Государственный архив Швеции. Полный размер. Крепость Ниеншанц (первая) и город Ниен. Фрагмент карты 1643 года. Крепость Ниеншанц (после перестройки) и город Ниен (фрагмент карты). Вторая половина XVII века. Государственный архив Швеции. Полный размер. План крепости Ниеншанц (после перестройки). 1681-1696. Государственный архив Швеции. Полный размер. Карлов бастион Ниеншанца. Раскопки 2006–2009 гг. Гельмфельтов бастион Ниеншанца. Раскопки 2006–2009 гг. Потайная дверь Мертвого бастиона крепости Ниеншанц. Раскопки 2006–2009 гг. Ключ. Ниеншанц. Раскопки 2006–2009 гг. Находки. Ниеншанц. Раскопки 2006–2009 гг. Находки. Ниеншанц и Ландскрона. Раскопки 2006–2009 гг. The Nevskoe Ustye settlement and 15th -17th century cemetery. 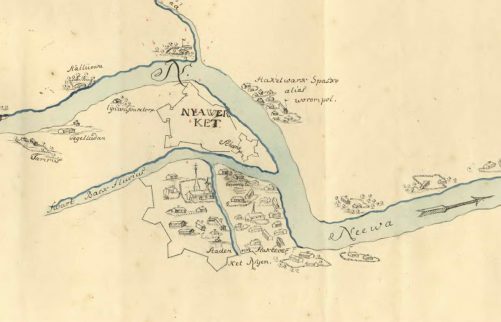 A Russian-Izhorsk settlement called Nevskoe Ustye existed at the intersection of the Okhta and Neva rivers up until the Swedish invasion. A 15th -17th century cemetery situated on the bank of the Okhta has survived from that time. 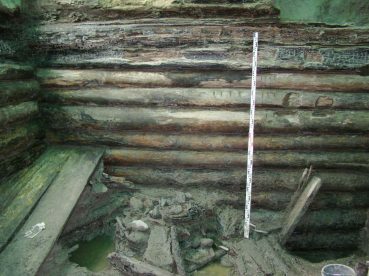 Two-thirds of it has not yet been explored, but thus far about fifty graves containing wooden coffins exist have been located. Some graves were destroyed by fortress construction in the 17th century, at which time the builders of Nientschantz reburied about two hundred remains in the fortress moat. The cemetery was in use until at least the 17th century. 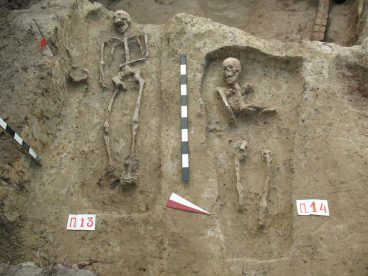 It is possible that soldiers from Peter the Great’s army, killed during the 1703 assault of Nientschantz, were interred there. Крестик в могиле. Раскопки 2006–2009 гг. A Swedish fortress named Landskrona was built on this site in 1300; in 1301 it was captured by Russian troops who burned and robbed it. 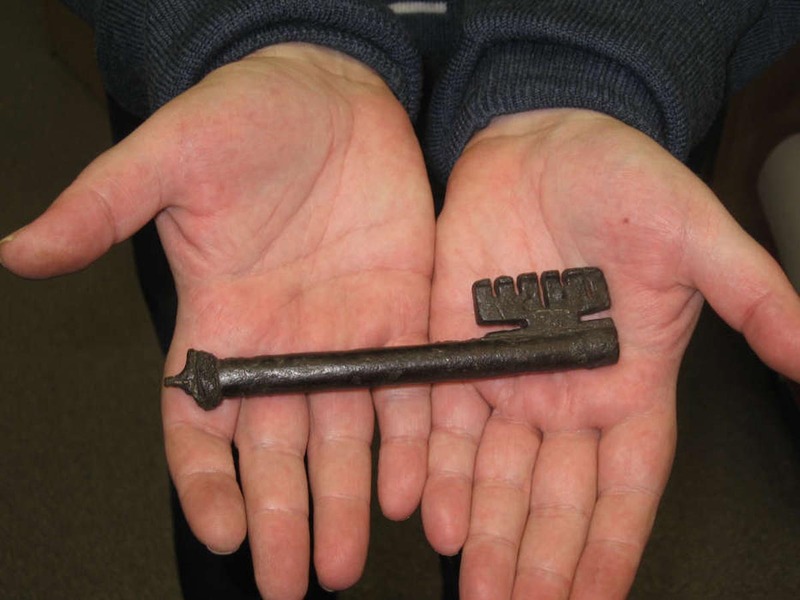 Traces of this assault and destruction have been discovered, including spearheads, catapult and crossbow arrows that were stuck into the side of the moat and wooden fortress walls, and charred wall fragments which were dumped into the moat. A four-meter tall section of the wooden donjon tower has also been preserved. Landskrona, with its wooden walls, moats and donjon tower, is a monument of medieval North European fortification architecture, unique not only in Russia but all of Northern Europe. Ров Ландскроны. 1300 г. Раскопки 2006–2009 гг. Носилки во рву Ландскроны. 1300 г. Раскопки 2006–2009 гг. Деревянная башня-донжон Ландскроны. 1300 г. Законсервирована на месте. Раскопки 2006–2009 гг. A fortified Novgorodian (Izhora) settlement once existed on Cape Okhta till the end othe the 13th century. Two of its castle moat lines remain. 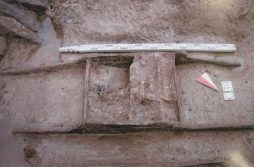 Nothing more can be determined about this site, as most of it has not yet been examined. 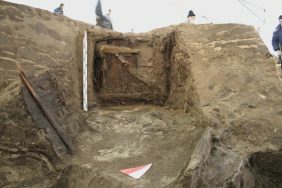 The researchers’ most unexpected discovery is the largest Neolithic site ever found in northwestern Russia. It has existed for two millennia; its first inhabitants came there more than 5,000 years ago. 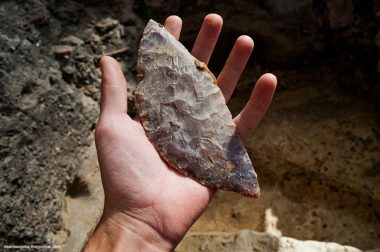 This is the first Neolithic site ever discovered in this region. 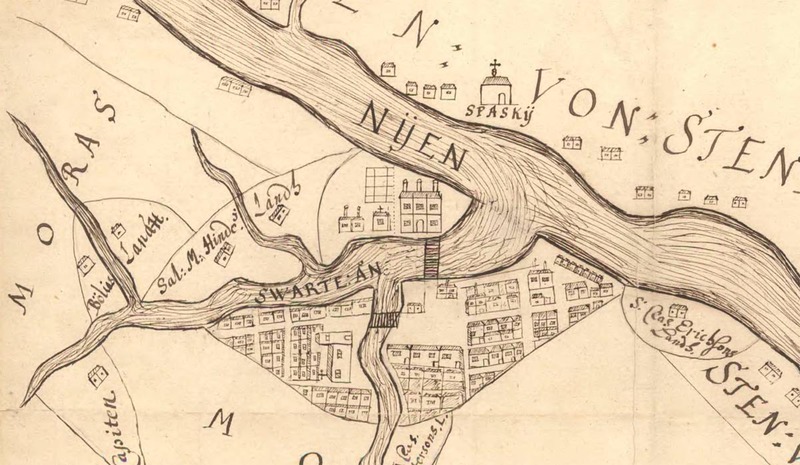 It existed even before the emergence of the Neva River! 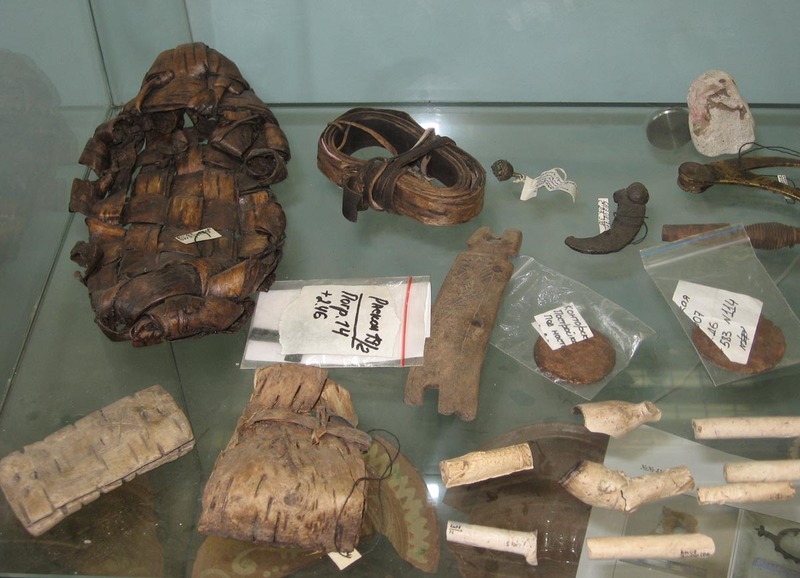 The condition and preservation of quickly decomposing materials (wood, bark, bones) is phenomenal. 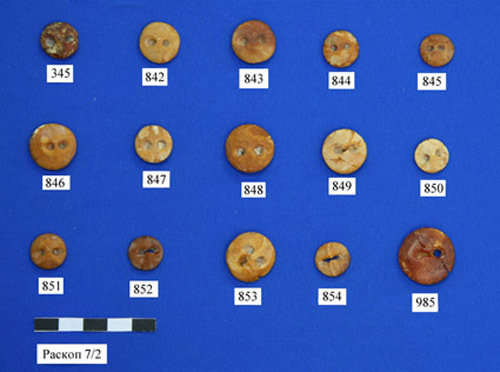 The damp soil on Cape Okhta has prevented this organic matter from deteriorating, which means that we can not only study fragments of primitive settlers’ buildings, but also determine what they ate, hunted and cultivated. 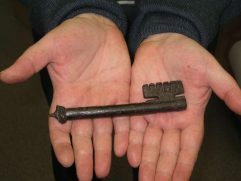 Archaeologists have discovered more than forty ancient buildings, including homes and dependencies. Various objects such as wooden flooring, birch bark boxes, remnants of fishing baskets, amber jewelry, pottery, stone arrowheads, axes and adzes have also been found. 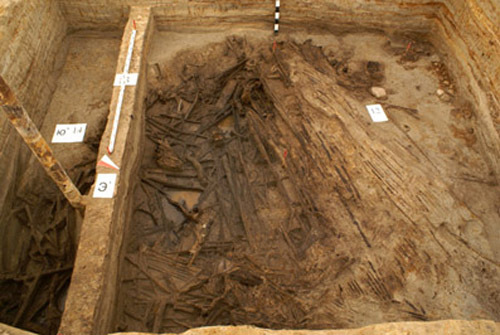 The preserved remains of wooden structures make this Neolithic settlement on the Okhta a remarkably unique site in northwestern Russia. Few such sites exist in all of Europe. Деревянный настил–платформа, эпоха неолита. Раскопки 2006–2009 гг. Фрагмент неолитического сосуда. Раскопки 2006–2009 гг. «Пуговки» — янтарные украшения эпохи неолита. Раскопки 2006–2009 гг. 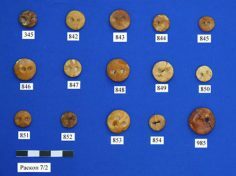 Сланцевые грузила, кремневые наконечники эпохи неолита. Раскопки 2006–2009 гг. Неолитический нож. Фотография Вадима Махорова. Раскопки 2010 г.
Archaeological findings on Cape Okhta have opened up a brand new page in the study of Russian history, significantly affecting our knowledge about the history of the Prinevsky Region and the prehistory of St. Petersburg. 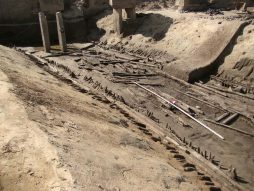 The unique, multi-layered archaeological monument at the mouth of the Okhta River has already been christened the “The Troy of Petersburg”. It must be preserved for future generations. 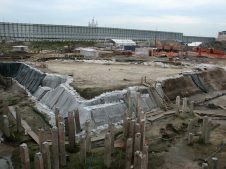 A historical cultural park, as well as an open-air archaeological museum, could be created here. 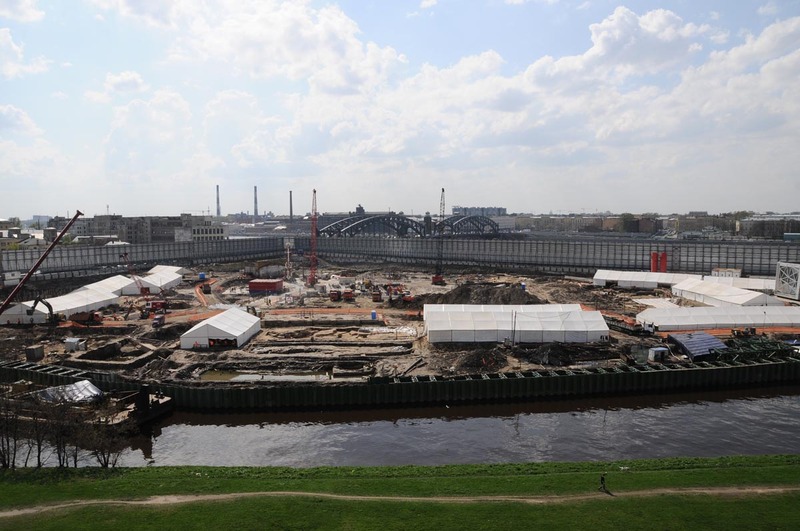 It is also possible to partially restore Nientschantz, and to create a museum of shipbuilding history and a museum of northwest Russian history on this site. 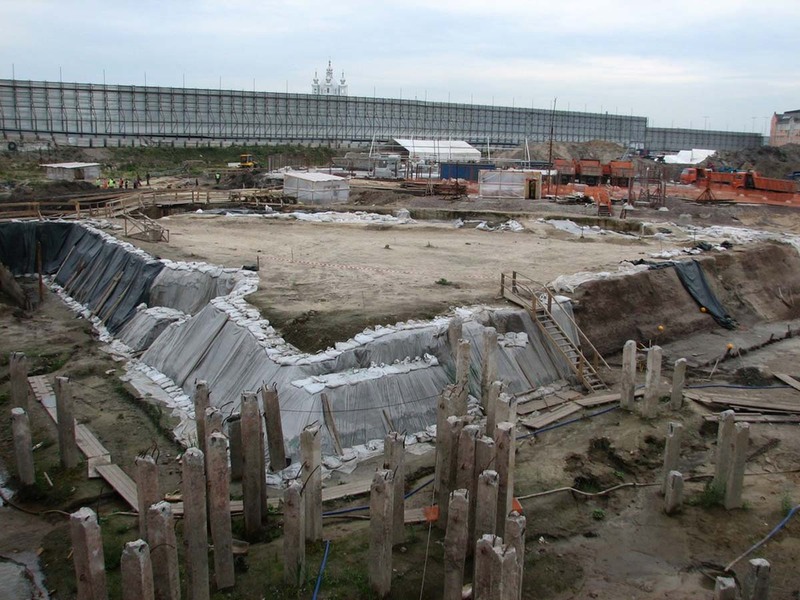 Today the Landskrona and Nientschantz fortifications and the remnants of the Neolithic settlement have been classified as newly discovered archeological monuments and are therefore protected by law. 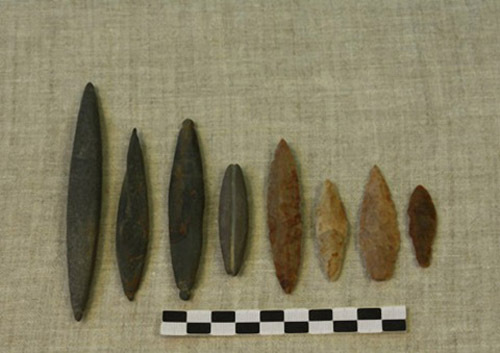 None of the items discovered on Cape Okhta can be excavated without harming other objects around them. There can be no question of construction on this site until historic preservation authorities make their final recommendations and decisions regarding its future.